Everybody talked about it. 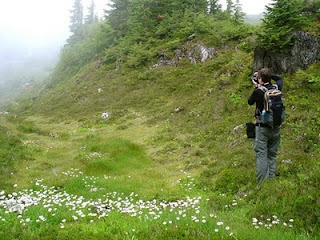 The WTA trip reports for the Walt Bailey Trail mentioned more than one bear. The ranger at the Verlot station agreed by saying, there were lots of bears on that trail. People we saw who were coming down the trail mentioned, "there's a bear up there". We knew we had to see it – we could not do the hike and miss the opportunity to see The Bear. While we were eating lunch in the meadow, a lone hiker whom we had seen ascend, then descend the trail, asked if we were continuing on the trail further up. We said we were and he proceeded to give us the exact location (and approximate size – big) of the bear. We looked at each other. OK, let's go see the bear. Suddenly, it felt like we were at the zoo. "Go up to the log, look up and to the left and you will see a big, black figure". We followed his instructions and suddenly we saw the bear. We said "hello" softly. It turned and looked at us and we could clearly see it was a big, black bear with a light brown snout. It kept looking at us. Using my innate bear psychology, this is what the bear was saying, "Leave me alone, I just want to eat my berries in peace with no more of your kind talking to me, singing to me and get your barking dogs away from me" I heard him loud and clear and we backed away until we had left him, staring off into the distance, alone in his berry patch. We went back to the lake, where I took over my own berry patch.